falafel and i are not good friends. or, to be more precise, homemade falafel and i are not good friends – i love these little spicy chickpea fritters but whenever i’ve tried to make my own i’ve had a disaster on my hands. and as for the sweet potato version i tried, to see if it was the chickpeas conspiring against me, well those sticky tasteless orange patties were truly awful. needless to say, it wasn’t quite that simple. my first difficulty came when my soaked chickpeas (36 hours of soaking, to meet laurie’s first two rules of using dried chickpeas and soaking them for at least 24 hours), wouldn’t turn into a smooth dough (rule three is to blitz the soaked chickpeas until they are very fine). my chickpeas wouldn’t go finer than dried couscous – which is a problem laurie had and which resulted in her falafels breaking apart when deep fried. oh dear. however, the mixture smelt fabulous and authentic so i decided to press on, leaving the dough (or crumbly mix in my case) to rest as instructed. 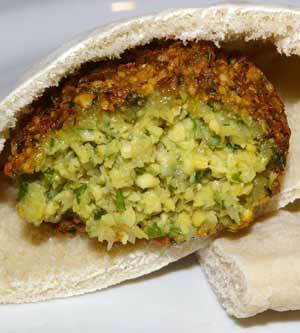 the shaped falafel actually had 24 hours in the fridge before being cooked. amazingly my falafel didn’t collapse when deep fried. and the flavour was fabulous once they were cooked. i had a problem with the first few which didn’t cook through properly on the inside, but as the oil cooled a little this problem righted itself. i wonder if a smoother mix would have also solved this problem. so there we are, a foolproof recipe which i managed to fool but which still resulted in fabulous fresh and tasty falafels. thanks laurie, it’s been fun cooking as you! check out laurie’s version of my pork tenderloin stuffed with caramelised onion, chorizo, lemon and spinach stuffing, with spinach and chorizo pilaf. soak the chickpeas in water for at least 24 hours. rinse and drain the chickpeas, and spread them out on a dishtowel to dry while you prepare the remaining ingredients. put the chickpeas, onion, garlic, parsley, coriander, ground cumin, ground coriander seeds, cayenne pepper, salt, freshly ground black pepper, baking soda, and baking powder in the food processor and process until the chickpeas are thoroughly puréed and the ingredients form a very smooth dough - this can take up to 5 minutes of processing (remember to scrape down the sides of the bowl from time to time).